Would you like to become a Shareholder in Peak Rail plc? Becoming a shareholder means that you are part owner of the railway and anyone aged 18 and over can apply. Shares can also be bought by adults on behalf of children. At present we have some 4,000 people who own shares in the Company. They all have a right to attend Annual General Meetings and vote on Company business. Shareholders also have the right to receive dividends, although no dividends are currently anticipated. Share revenue is vital to Peak Rail in progressing the development of the railway, for example extending the line and purchasing assets for use on the railway, such as buildings, track and rolling stock. Shares can be sold by shareholders to other people and they are also transferable on the death of a shareholder. For those who are interested in acquiring shares, or adding to their existing shareholding, but do not wish to make a large single payment, Peak Rail’s “Share Club” may be of interest. Joining this Club allows someone to acquire shares on an annual basis by making a small monthly payment, helping to spread the cost over time. Alternatively, please use the electronic Share Purchase Enquiry form below. 100-499 shares – Four ordinary all day tickets each year for the length of line in use. The above tickets cannot be used at Special Events. 500-999 shares – “Peak Rail Silver Passport” – A family pass (for a maximum of four family members) for unlimited travel on the railway and which grants the holder 10% discount on any selected purchase in any Peak Rail shop (but not to catering outlets). 1000 shares or more – “Peak Rail Premier Passport” – A family pass (for a maximum of four family members) for unlimited travel on the railway and which grants the holder 10% discount on any selected purchase in any Peak Rail shop (but not to catering outlets). 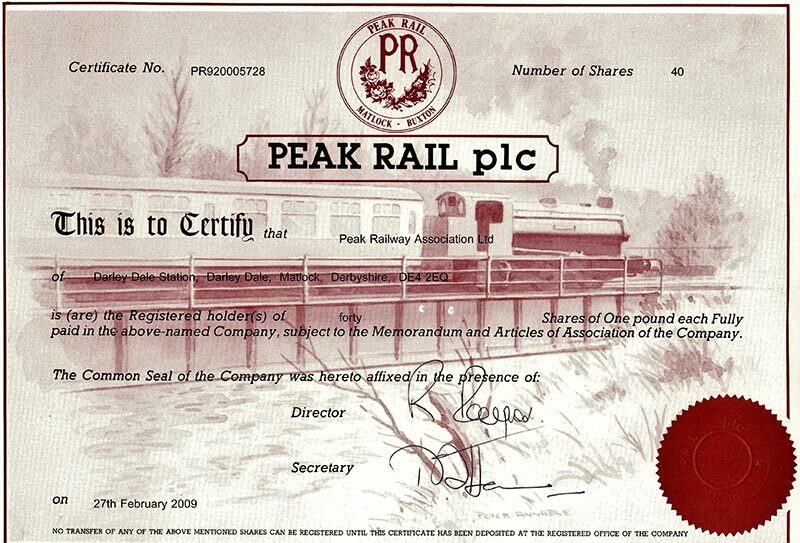 Use this form to find out more about buying shares in Peak Rail plc. Share certificates will be issued as soon as possible, but please allow up to six weeks for delivery. There is no established market for the shares and neither is there any guaranteed dividend.